See our payment methods and details. Ceramics Sofia accept payment by Paypal or Bank Transfer: when ordering you can choose your preferred mode for carrying out the payment. Paypal is one of the safest online payment methods at all. The payment details will not be aware of Ceramics Sofia, but PayPal will reside on servers, equipped with 3.0 and SSL 168-bit data encryption, the highest level available (if you want more information, read: Secure shopping). The system is free and involves no additional cost. To use Paypal must have a Paypal account? No. Even if you do not have any Paypal account you can pay with your credit card on Paypal's secure server, no need to open an account or otherwise. Ceramics Sofia is "Paypal Verified", What does it mean? From the PayPal site: "The PayPal verification system allows you to get more information about users before sending their payments through PayPal. Verify that the information below is consistent with the company, organization or person you want to send the payment. 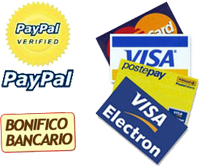 To become a verified PayPal user in Italy must register with our program code verification. After completing the registration with code verification, the user is subjected to additional checks that increase security for all PayPal users." Banck "BANCA AGRICOLA POPOLARE DI RAGUSA"